A few sporting good stores in the 20's supplied the gangs directly or indirectly with their weapons of choice to create mayhem in Chicago. The most famous of one of all was Peter Von Frantzius.Peter came from a rich German family whose father made his fortunes in market speculation. 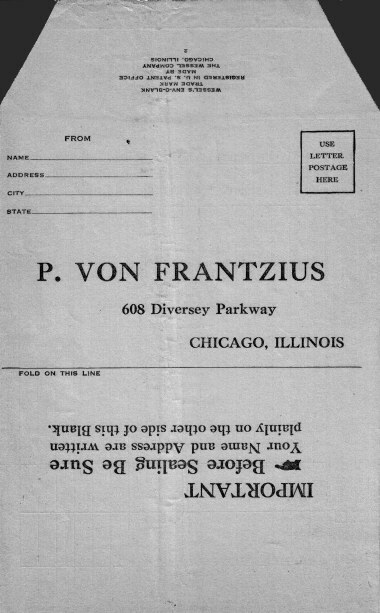 Von Frantzius started selling guns via mailorder from his parents home.He became quite successful and with the funds acquired set up his own shop at 608 Diversey Parkway. 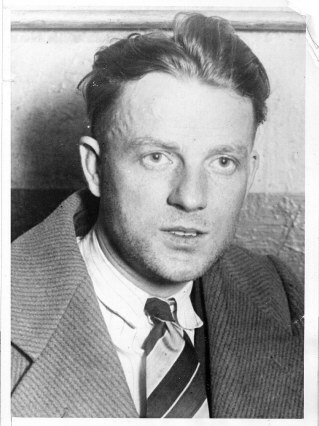 Many guns found at and around murder scenes were traced to his shop.Notably the machinegun used at Frankie Yale's murder and the machineguns found in Fred "Killer" Burke's posession.These were positively linked to the St. Valentine's day massacre and linked to Von Frantzius. 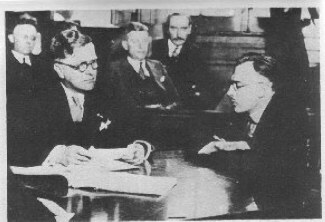 Peter Von Frantzius (right) being questioned by Herman Bundesen at the St. Val Massacre inquest. When investigators visited Von Frantzius' shop at 608 Diversey they found a tree trunk in the back of the shop used for target practice with thompsons. Most thompsons were purchased by gangland through an agent. 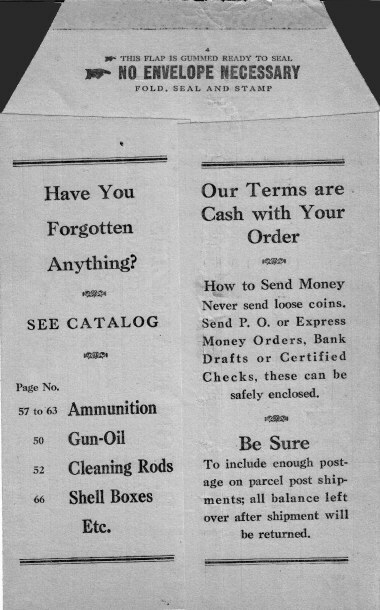 Example of a popular machine gun dealer at the time was Frank Thompson. He would purchase dozens of Thompsons from Von Frantzius and in turn sell them to various gangsters at a higher mark up. 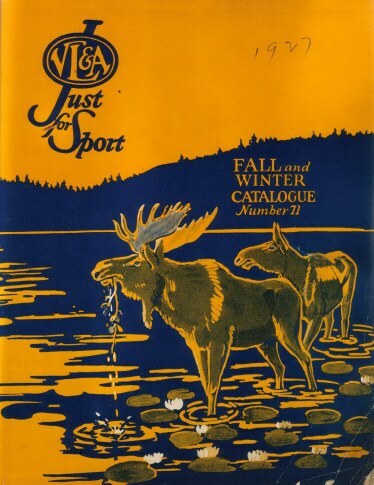 Front page of Von Frantzius 1927 catalog. 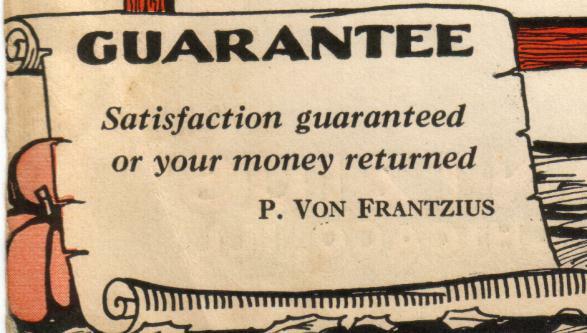 Von Frantzius always made sure his customer came first. Catalog page showing theThompson for sale by Von Frantzius. One simple Thompson without the cutts compensator to prevent rise in firing the weapon cost only $175. For $200, you could have the gun with the compensator and a 20 rd clip. Also in the catalog you could seperately purchase 20 rd clip, 50 and 100 rd drum and 100 rds of .45 ammo at $4.72. 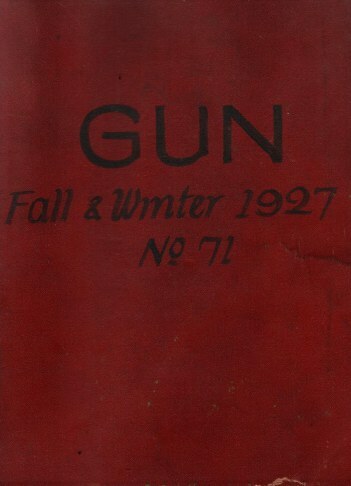 Just below, the Thompson gun, Von Frantzius also sold police belts according to the current regulations of 1927. On the left, bullet proof vests. Modeling the bullet proof vest is none other than Louis/Elliott Wisbrod. 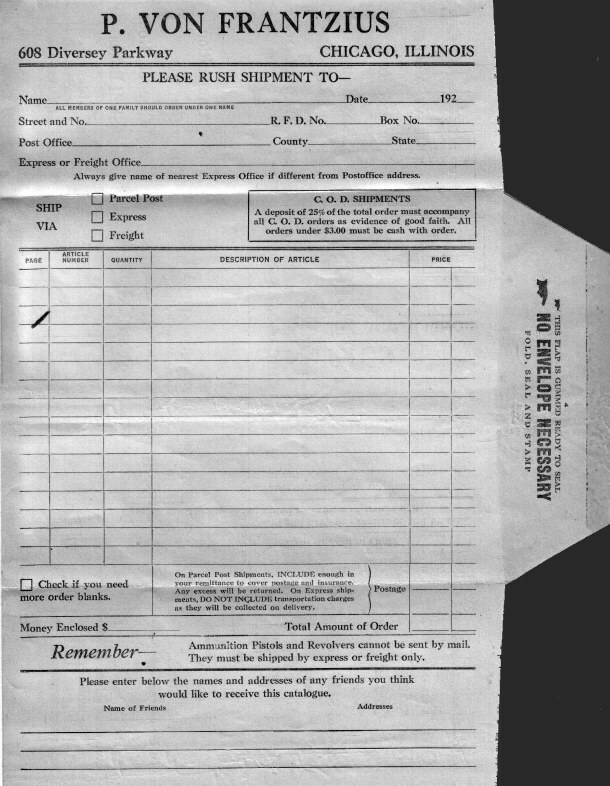 Peter Von Frantzius mail order form. All someone had to do was select item, enclose check and mail it off. The item could even be paid via cod upon arrival. Gangland rejoiced in the acquirability of the Thompson. For $2.00 Von Frantzius would remove the serial number off any weapon sold. This was done to avoid traceability to the crime.Von Frantzius employed an Austrian gunsmith by the name of Valentine Juch. Both he and Von Frantzius were very obliging at a price for certain illegal services such as selling weapons with filed off serial numbers and keeping the buyers name off the records in his shop. During the St .Val inquest Von Frantzius was asked point blank how he felt about the guns he sold ended up in the hands of gangsters. He simply replied that all he cared was to sell them and make his money. Situated in the Northside, his shop equally served all the gangs of Chicago.The Northsiders bought many guns and were regular customers. Peter Von Frantzius was also an inventor with various patents to his name. Another famous gangland armourer was Louis Scaramuzzo, who lived at 5347 S. Sawyer Ave. He ran his gun shop at 851 South Halstead street, and was noted by Chief of Detectives William Shoemaker that Scaramuzzo was known as a "Gun Mechanic" for the West side gangsters. He is also reputed to be a Genna and Capone gang armourer. Scaramuzzo knew the Gennas and was once interrogated about the St. Valentine massacre by authorities. Scaramuzzo had once brought a buyer to Peter Von Frantzius' shop, this in order to get a Thompson machine gun for his client. Scaramuzzo mainly did this in exchange for some gun parts Von Frantzius had. Detectives were also very curious as to how Scarmuzzo's own shop sold so many guns over the years, but never had any records of these sales. 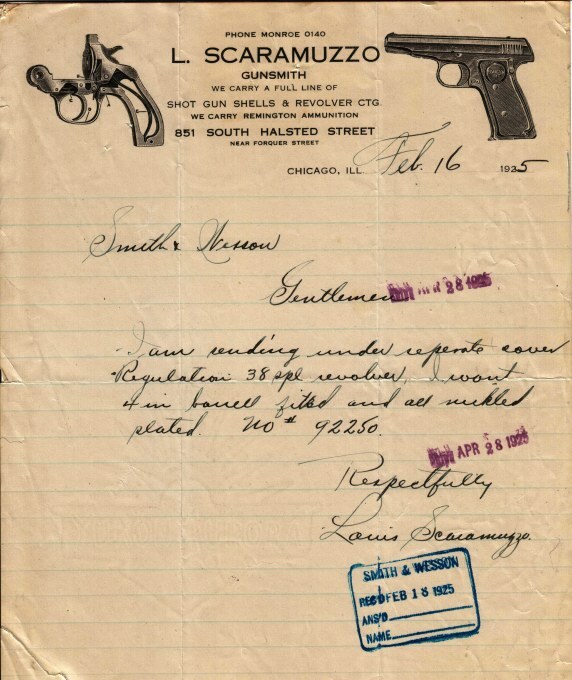 1925 signed letter from Louis Scaramuzzo sent to the Smith and Wesson company for plating, and putting a four inch barrel on a .38 special. At the beginning of 1930's, Scaramuzzo relocates his shop at 604 Blue Island Avenue. On November 2,1931, Detectives raid his Blue Island shop in which they find liquor and several guns with the serial numbers defaced. Scaramuzzo claims these guns were simply there for repair and that he had nothing to do with the defacing part. 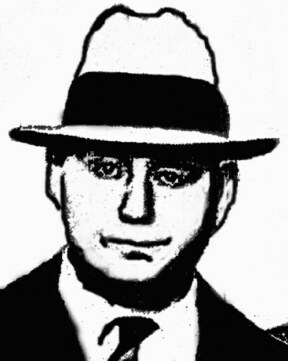 On February 5,1932, Scaramuzzo is found guilty. He is sentenced to a year in the Bridewell Penitentiary, and fined $300. He never does a day in jail as his record is later stricken, and he is completely exonerated of all charges against him. Alex Korecek, hardware dealer who also sold guns on the side. He was believed as supplier of weapon used to kill McSwiggin and friends. Koreck was also guilty of buying Thompson submachine guns from Von Lengerke and Antoine, one of which (Serial number 4656) that was used to kill Hymie Weiss and Patrick Murray in front of Holy Name Cathedral. Korecek was terrified gangsters would kill him if he talked. 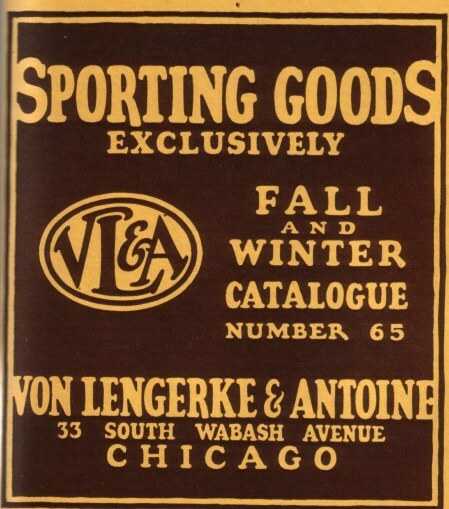 Another machine gun sporting goods store was Von Lengerke and Antoine, situated at 130 South Wabash (later 33 S.Wabash). They had sold Thompson machine guns used in a few gangland hits. Most notably, the guns used in the Hymie Weiss and possibly in the accidental McSwiggin hit. 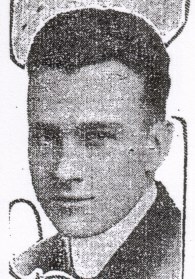 Oswald Von Longerke, one of the owners of Von Lengerke. Just below that is the second store address at 130 South Wabash. During a Coroner's inquest Edward Weidener, who was a manager at VL&A had testified that his company had sold 50 Thompson machine guns in the last 8 years. After being 49 years at the corner of Wabash and Van Buren, Von Lengerke and Antoine move to 130 South Wabash. 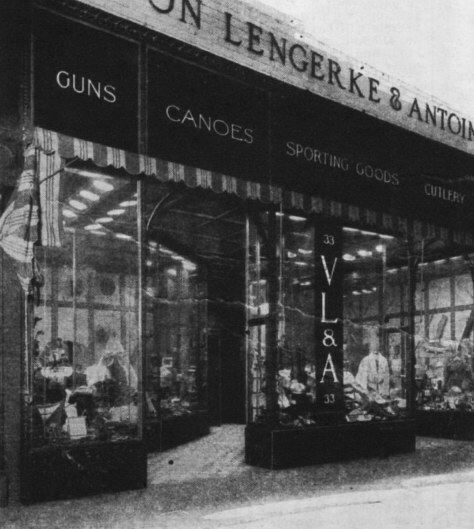 In 1924, Von Lengerke and Antoine moves their store to 33 South Wabash. In the Early 1940's,they move yet again to 7 North Wabash. John Alex Koracek, who was a one time hardware dealer had remembered selling a thompson he aqcuired through VL&A to a Capone associate named Charlie Carr. Many found their way into the hands of ex- convict and sporting goods/ arms dealer Frank Thompson, who posed as vaccuum company salesman. 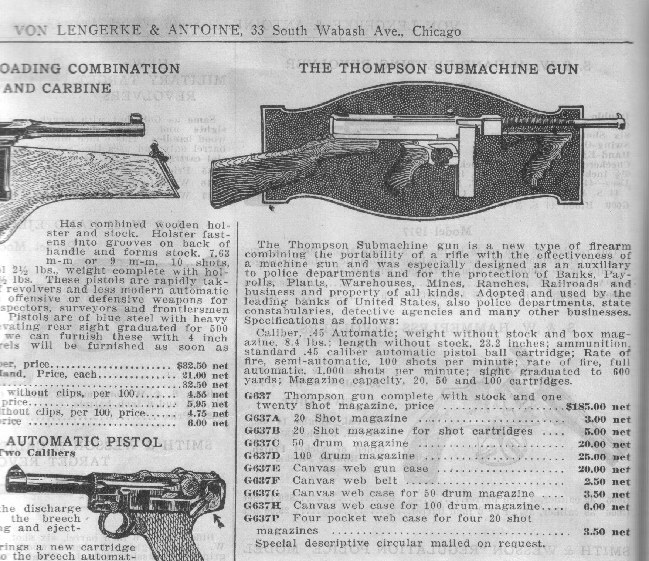 Thompson had purchased at least 9 Thompsons from different Chicago sporting good stores. While most thompsons were purchased by legitimate means such as to protect companies etc..., some eventually fell to the wayside and ended up in gangland's grip. Some where purchased through crooked ex-cops who still had connections for the right price. 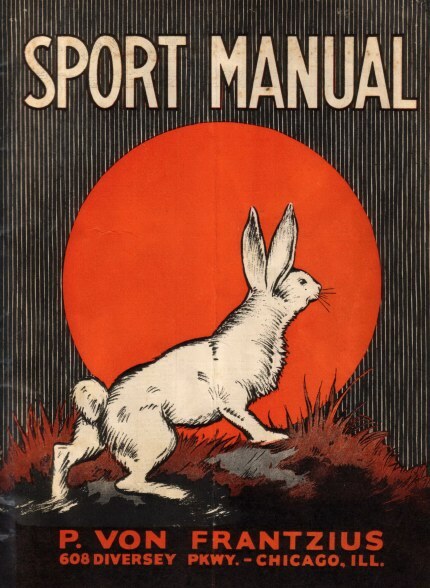 Thompson making it's first appearance in the Von Lengerke & Antoine catalog circa 1924. For $185 you could get it with a 20 round stick mag. 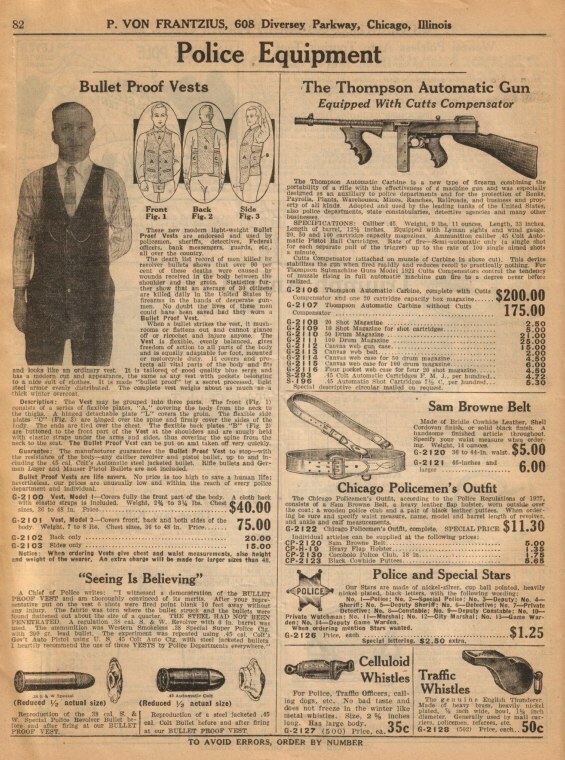 The Cutts compensator used to prevent rise while shooting was later added in the 1927 catalog below. 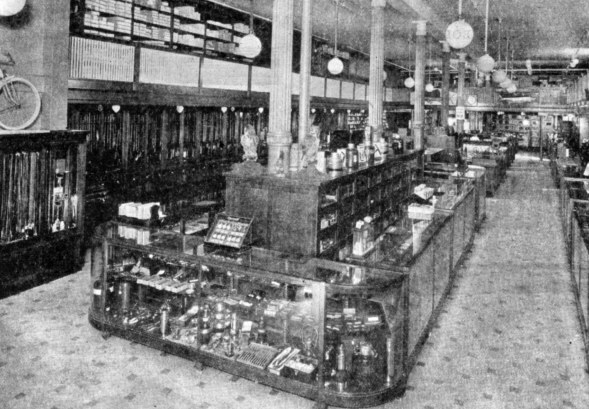 A peek into Von Lengerke and Antoine's store at 33 South Wabash, circa 1924. Bound 1927 Von Lengerke and Antoine catalog from 33 South Wabash. This store catalog used by employees and has special blank pages in between for price adjustments. 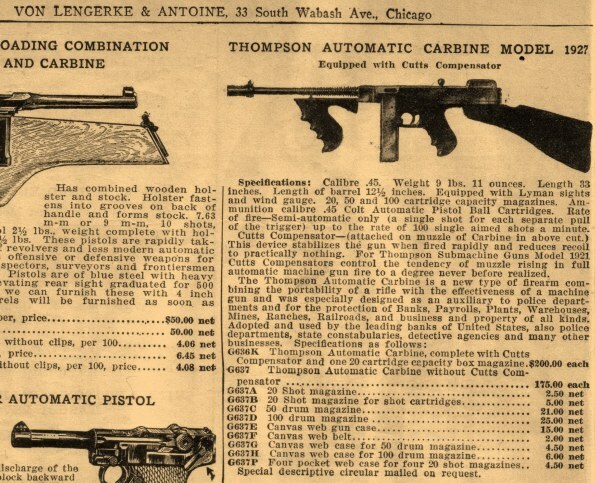 The infamous Thompson machine gun for sale in Von Lengerke and Antoine's 1927 catalog. A well deserved special mention of thanks to my friend John Winkeler. He graciously helped me obtain these exceptional pieces of history.